The legislature and the judiciary is heading on a collision course with the all-party meeting convened by the Lok Sabha Speaker Somnath Chatterjee decided to “return” the notice issued by the courts in cash-for-query scam. Atleast 54 persons were killed and 15 injured when a private bus in which they were travelling rolled down a deep gorge in the border district of Rajouri today. The condition of five of the injured was stated to be critical. Do khap panchayats have any right to interfere in marriages? 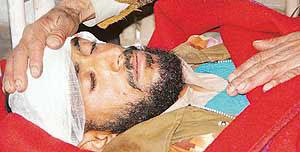 An injured bus accident victim is comforted by his relative at a hospital in Rajouri on Friday. non-proliferation record and rubbished Iran’s imputation of putting the Iranian and Indian nuclear programme in the same basket. Judging by the mood of the Congress delegates gathered here for the three-day AICC plenary session, the stage is being set for the coronation of the party's heir-apparent Rahul Gandhi. The party rank and file, which was disappointed when he was not inducted into the CWC in the recent revamp, are now preparing to voice their disappointment at the AICC session beginning here tomorrow. The Indian Institute of Management, Bangalore, today set in motion a plan to enable it to carry out its expansion in Singapore and other foreign countries. The institute, whose Board of Governor’s met here today, said the board had approved a decision to change the Memorandum of Association of the institute so that it could go ahead with the establishment of a Singapore campus. Chief of Army Staff General J.J. Singh today said infiltration into Jammu and Kashmir had been “contained to a great extent” and hoped that Pakistan would live up to its promises to completely stop cross border terrorism. Named ‘‘Dosti’’ (friendship), the bus from Pakistan that entered Indian territory today flaunting the national flags of both the countries on its front screen, bridged the gap between two Punjabs (East and West), that were divided by the Radcliff Line 58 years ago. 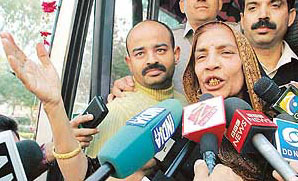 Pakistani singer Reshma sings her popular song "Lambi Judaai" as she alights from the first bus from Lahore at Amritsar on Friday. I decided that this is a matter which really concerned the members of the House more than the Speaker.